Jason is a son in the Lord to me. You'll find him and Whatcom County in the book Operation Rolling Thunder. In 2005 they were the least churched county in the US. 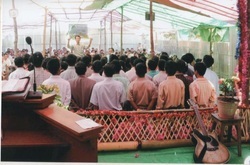 By December 2010 they had seen 36 new congregations added to their county. That is just one of many examples of what Christ did through His Church in their county found in the book. They have helped pioneer this powerful prayer strategy. Jason mobilized enough prayer that since May 2007 we've had 24/7 prayer in his county. In November I came and help them establish strategic (apostolic) councils representing the 7 spheres of society. Four years later they now have 9 strategic councils. This is their "Transformation Task Force." They also have 32 churches cooperating together lifting up 24/7 prayer one day each month. Light of the World Prayer centers serves the county as the base of operations (communication hub) coordinating the 24/7 prayer and the targets. Two human traffickers were arrested in Whatcom county and a girl was rescued this past week! Crime rates in WC have dropped by 15 percent. Unity is increasing amongst pastors and leaders in WC. 12 key law enforcement agents gathered for a breakfast this summer and training on prayer and trusting the Sovereignty of Christ! The Hispanic churches had a historic gathering at Bloedel-Donavan park and the gospel was preached at the end of the time together. Bellingham Christian hired two new spirit filled teachers and are focusing on Discipleship to Jesus this year with staff, and students! Our health team leader who works at St. Joseph hospital was asked to pray over the microphone on Tuesdays and Fridays every week! J This prayer reaches every room in the hospital. I am very aware that God is moving in the Inland Empire (IE) and doing great and mighty works within each of us. I am also assured by Him that the DNA in our region is different than the DNA in other areas and He knows how we are rightly fitted with others. We look and act different so the Church in the IE is created to be her own unique piece of the whole. Our Lord is moving mightily in the Government sphere as a direct result of ORT prayers uniting with the prayers of all the saints prior and currently going on. Our prayers, combined with others, have provided an open heaven in the government sphere and the Church is experiencing a welcome and encouraging willingness to work cooperatively in our current economic and moral culture with leaders in the fire, police and human services departments. 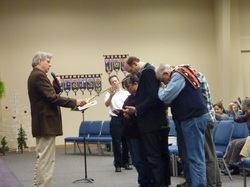 As a direct result of ORT, Cheney Community Church has taken prayer to a new level for the Education sphere. In August I was talking to Holy Spirit about ORT in our region. What does it look like in Your eyes and heart and mind? What portion of Your plan for uniting the body of Christ in our region do you want us to play? Why does it seem that we are still embryonic in nature here in our region and appears not to be developing at the rate I think it should? On August 29th I was visiting my daughter in Edmonds and while there I got a call from Tim Taylor asking me how things were going and how could he encourage us. We talked for quite some time, I opened my heart about my thoughts on ORTINW and he was very supportive. I flew home on August 31st, leaving Edmonds and flying over our state in blue skies, warm weather and filled with sunshine. As the plane descended into Spokane we entered a very dark cloud and the plane was a bit unsteady as she landed. When I arrived at the airport it was pouring rain. My friend Marian was there to pick me up said the rain came on suddenly. The winds were very powerful with heavy pelting rain, she said, almost causing her to pull off the road because it was difficult to see at times. Marian dropped me off at my car in Spokane Valley, where I live, and as I drove home directly in front of me was a bright, full double rainbow. I couldn’t believe it. Again, like the record rainfall in the spring of 2010 when ORT was accepted by leaders in our community and the solar flare in October 2010 at our first ORT kickoff our heavenly Father was assuring us that YES, ORTINW is in His plan and YES we are to wait patiently for Him to reveal and release all those who would join us. We connect to God through Christ’s humanity and God connects with us through Christ’s divinity. 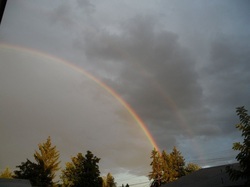 I believe this double rainbow was a sign of this ‘double’ in the covenant He has made with us. And because God has chosen to use supernatural signs in the skies to mark Operation Rolling Thunder (ORT) to encourage all of us, may this be an encouragement to you as well. Keep moving. In the storm clouds around you, God is up to something. In the storm clouds of your life and in the suddenliesthat come upon you, know that there is a rainbow He is creating just for you. Isaiah 43:1-3 Thus says the LORD, your Creator, O Jacob, and He who formed you O Israel, “Do not fear, for I have redeemed you, I have called you by name; you are Mine. When you pass through the waters, I will be with you; and through the rivers, they will not overflow you. When you walk through the fire, you will not be scorched, nor will the flame burn you. For I am the LORD your God, the Holy One of Israel, your Savior”. Praise the Lord, our God is really amazing. This is a wonderful testimony of what the Lord has done through the previous ORT at XXXXXXXXXXXXXXX (name removed for security) on 26 and 27 of August. We had Women Conference with Fasting and Prayer according to the strategy of ORT......... Many are healed and received the gifts of the Spirit. Among them, one sister named Mrs. xxxx xxxxxxxx (name removed for security) age 35 was a barren woman. She is married with Christian man named Mr. xxxxxxx for 15 years. ..... She has been trying her best with the help of famous medical doctors to get pregnant. The doctors have surrendered her and said that she cannot have a child. She was very upset and her husband thought to divorce her since she could not get him a single child. With a bitter crying, she requested for us to pray for her to get pregnant. We all fast and prayed for her and felt nothing during our ORT program. But after two weeks past, I received a phone call from and she told me that the doctors confirmed she has conceived via ultrasound. She could not believe that great and wonderful blessings of the almighty God. She and her husband are now very happy and give all thanks and glory to the Lord. Our God is great. We experienced the goodness of our God all the time when we have ORT. God is moving with his people through prayer. Hallelujah!